Our Marketing & Design Intern, Hannah Gray, had the opportunity to talk with some of our Speaking in Species artists. In this Q&A, Hannah learns how Mark Gardner's family inspires him to create. How did you come into this career? Woodworking was my father's hobby and he was the one who got me interested and encouraged me to start making furniture. He registered me for a furniture-making class he was taking at the University of Cincinnati when I turned 16. A class I continued to take all through high school and college. Dad had a lathe and took a turning class at Arrowmont the spring I graduated from high school. Seeing what he brought home from the class got me excited to try turning bowls myself. 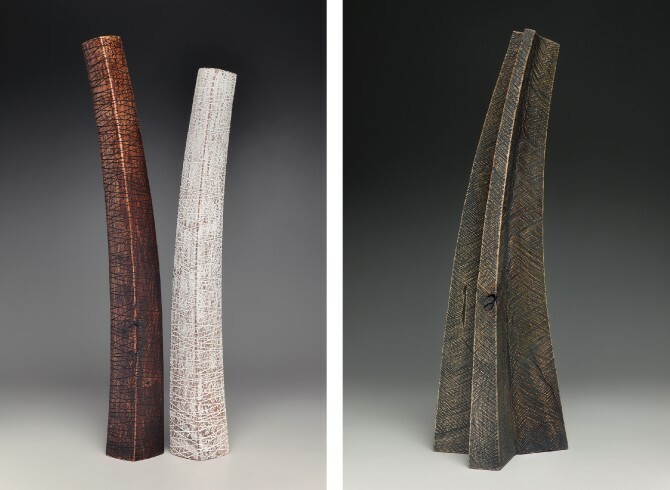 In 1996 after I graduated from college I too got to take a turning class at Arrowmont and from then on I was determined to work with wood making stuff. Where do you get your wood from? Most of the wood I use is in log form and comes from arborists and sawmills. How does the particular wood species influence the form that results? Only as much as different tree species grow in different ways. The color, shape and size of the log have more influence. My pieces are curved because they are made from curved logs. Before I read anything about your work, Shadow immediately reminded me of the ivory tusks that are carved as altarpieces in the Kingdom of Benin. What other sorts of things (African art or otherwise) influence your work? You are exactly right. I love the artwork of Benin and get great inspiration from their cast bronzes and carved tusks. I also look at a lot of Oceanic art. The idea of ceremony and paying homage have always been important to my work. Lately the logs and trees, their shapes and sizes, have been influencing my work the most. What stories are being told with these pieces? The piece in the catalog is about my relationship with my younger brother since our father died. It didn't start out that way, the forms were intended to be individual "tusks" and stand on their own, but as the piece came toward completion I realized that they should be paired together and that seeing them that way reminded me strongly of my brother and myself. Then it got it's name "Shadow" as I'm still not sure which of us is in the other's shadow. My feelings on this change all the time. Sometimes I feel that we are, both of us, in Dad's shadow as he was such a huge presence in our lives. Why do you use the chainsaw? I began using a chainsaw when I started turning bowls. It is the quickest way to reduce a log into suitable blanks for turning. One of the things that drew me to turning and away from furniture was how immediate the turning process was compared to building a piece of furniture. I was a slow furniture maker and at the lathe I could make something in an hour or a day compared to weeks or months. The chainsaw is even more immediate than the lathe. I can rough out an idea with a few cuts. It is a subtractive process to, like turning and I think I find this more enjoyable than the additive process of furniture construction.